Knobstone Trail, IN | GetOut! Often described as Indiana's Appalachian Trail, the craggy Knobstone Trail has its own set of charms. The Hoosier state's longest footpath stretches 58 miles through a dense forest and boasts steep elevation changes to satisfy even experienced hikers. 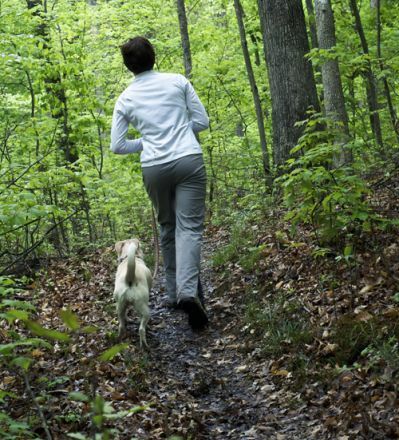 "Many people use the whole trail for an Appalachian Trail training ground," says Dale Brier, the Streams and Trails section chief for Indiana’s Division of Outdoor Recreation. Dale adds that the trail is the perfect choice for day and thru-hikers alike. “It’s very isolated, you're kind of broken off from society entirely. It doesn't take 15 minutes before you can't hear anything. And it does have a lot of topography for that long of a trail,” Dale says. Snaking through the southern half of the state, the Knobstone Trail passes through Indiana's most rugged terrain, the Knobstone Enscarpment. The KT offers more than 20,000 total feet of elevation change thanks to the escarpment's steep limestone knobs, including Weed Patch Hill, with an elevation of 1,000 feet above the low-lying farmland below, and Round Knob, one of the highest points on the KT where you can see Louisville on a clear day. Dale says middle sections of the trail are most challenging, and the Delaney Creek trailhead is ideal for day hikers, since it is a six-mile loop that starts and ends at Delaney Park. The park features a lake, camping and fishing. For the most challenging hike on the KT, start around mile 24 near the Leota trailhead and continue to Elk Creek around mile 31. It contains steep, long climbs in just a short span of six to seven miles. Be aware that water is surprisingly scarce on the trail. And for day and through hikers alike, Dale says you should consider poison ivy and the heavy tick population when dressing for the trail, so you don’t pick up any unwanted hitchhikers. Most recreation areas and campgrounds are located at Delaney Park, Clark State Forest and Deam Lake State Recreation Area. Primitive backcountry camping is allowed along the trail only on public lands at least one mile, by trail, from all roads and recreation areas. Where it's at: The southern (Deam Lake) trailhead is half hour from Louisville; there are eight trailheads total. Visit knobstonetrail.net for specific directions to every trailhead.